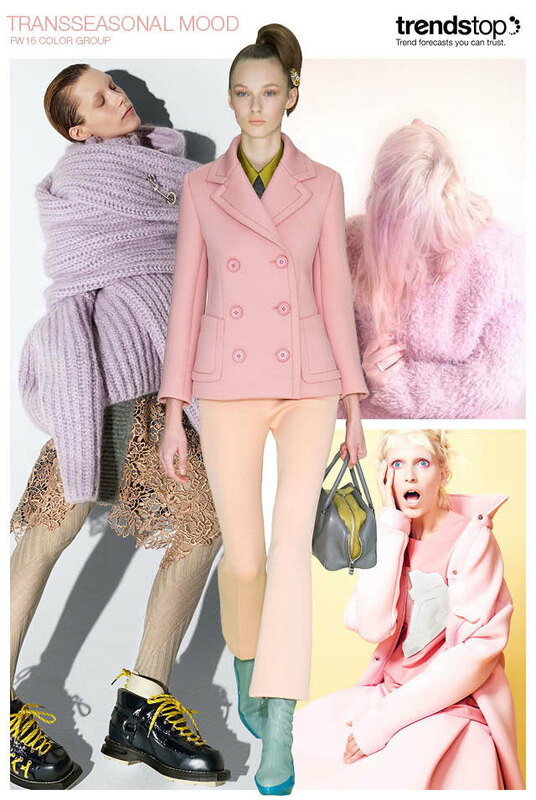 Here is a preview of Candy Pastels, a directional color group trend for Fall/Winter 2016-17 as predicted by Trendstop. These youthful and sugary shades introduce a feel of girlhood nostalgia, recalling the milky effect of the Crayola pencils used at school. Ideal for your first intake at the end of summer, this aspect of the Candy Pastels trend demonstrates how color is becoming much more transeasonal in fashion; the lines between seasonal intakes are blurring, and sales are starting earlier. As a result, lighter shades like these will be key for F/W16, bringing a touch of summery warmth to your deeper winter collection. We see how sweet pink, peach, lilac and mint tones look clean on spongy surfaces like neoprene, while cozy oversized knits create comfort. image courtesy Trendstop: Prada Fall/Winter 2015-16, Acne Studios Pre Fall 2015, Damien Kim. images courtesy Trendstop: Next Generation Fall/Winter 2015-16, Charlie Engman, Karl Kleiner, Bence Bakonyi. The inspirational Fall 2016 Trend Forecast Presentation, taking place in New York on May 6. Join the insightful presentation packed with trend inspiration, consumer trends, colors, prints materials and more, helping you get ahead for the Fall 2016 season. Click here to find out more. Immerse yourself in a spectrum of new season shades, and discover the most inspirational colors emerging in womenswear fashion. Initially pinpointed in our FW15 global analysis, the experts at Trendstop reveal how these essential shades will influence US fashion markets for F/W 2016-17.